Some of you may remember when the Countryfile team visited the farm during 2016’s mint harvest. It was such an amazing experience and so exciting to see the farm on the programme. Our founder Sir Michael, and Farm Manager Ian showed Anita and the team around the farm and talked through the process from harvest to distilling. 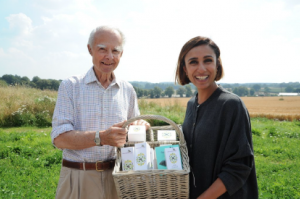 This Sunday’s programme saw Summerdown Mint returning to our screens as Countryfile dipped into the BBC archives to look at food heroes across the UK who are producing unusual and exciting food.